Gather round poets, lovers of poetry (and poets), and the pathologically curious while I tell you a tale of a little bookstore that could and then couldn’t when ‘could’ wasn’t enough. It’s a sad tale, one that affects all who enjoy the heft of a printed volume in the cradle of their palm. The book is dead — at least in the configuration that collects information, prints it on paper and binds it into single or multiple volumes. Long live the book! Information is no longer solely available in the bottleneck of the printed page, bane of the dyslexic and the functional illiterate. Literacy is here to stay but has become multi-literacy in that a reader now scans more than just the linear scrawl of print on paper. This news, if it is indeed news, is on the verge of going stale. The bookstore will soon join a category of antique store where the past is available for the nostalgia trade and interior decorators. Hopefully there will always be libraries but even their emphasis on the printed word is shifting toward ethereal electronic sources. The generation that once converged on the retail book shop to grasp the shiny cover of the latest tell-all bestseller or crime thriller in eager hands is aging. That which was once thought to be an undeniable necessity as were harnesses, hayforks, and horseshoes is being left behind on the roadside of the information superhighway. It was such an insensible future wave that crashed upon Susan Ryan’s River Reader bookstore in little downtown Guerneville at the outer reaches of the west county universe. To say that it was located off the beaten path might be an understatement. That neck of the woods is certainly affected and dependent upon the tourist trade. Unfortunately tourists are not always the literate types or they have found convenience in simply placing an order to a faceless app more to their sense of leisure and entitlement. The literate and their bookstores thrive in the more densely populated urban environs of course, and so a drive of a half hour or more for anything other than the generality of looking at scenery is a bit much to ask. Even for those living in the winding road redwood wilds, the task of gearing up and getting to town for more than bare necessities is often a chore. Although Susan and her bookstore offered ample opportunity and reason for a trek to the edges of civilization, few availed themselves of the occasions of literate entertainment so generously offered. To be a literary outpost in a wired age is a disadvantage. How swiftly technology changes the way we do business and each new change institutes another detour to our approach. What was once the standard of literacy is now a quaint measurement, an historical guide, less and less common, the province of specialist and collectors. Susan Ryan valiantly did her best to stay afloat in the face of a triple whammy of the technoconomy, ‘remote’ location, and general apathy. 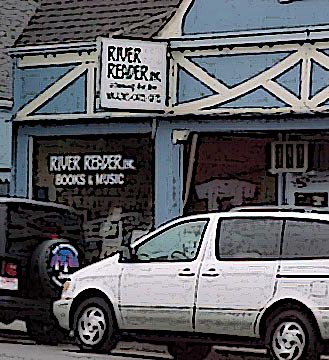 The loss of River Reader bookstore for the literate gentry hiding out in the smoky damp hills is more than inconvenient. Bookstores are not merely commercial enterprises, they are cultural assets. This little shop out in the middle of BFE had become a resource and a focus for writers to display their wares, conduct lively readings, and hang out with others of similar verbose persuasions. River Reader encouraged those who practice their craft and sullen art and exposed the resident talents to the neighborhood and beyond. The importance of such a venue is immeasurable, and now that it is gone, its presence sorely missed. 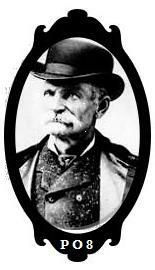 Sadly, though not as deeply, The New Black Bart Poetry Society must also say adios, a victim of its own altruism. Thanks are due to those who participated in person and those who sent encouragement along with their regrets. Many in attendance at the historic first and last meeting recognized the potential of the Society’s proposals for lively discussions regarding the art of poetry outside of the academic purview. Perhaps a seed was planted. This entry was posted in Poetry, Poetry Society and tagged Modern Poetry, OuLiPo, outlaw poets, Pataphysics, Poetry, Poetry Blogs, Poetry Lectures, Poetry Lessons, Poetry Society, Poetry Talks, Poets, River Reader, Schools of Poetry. Bookmark the permalink. After the alien invaders destroy our tech-driven society with well placed EMP’s and send us back to the Bronze Age, poets, proseits, and comic artists, will be shown the respect due to those who can alleviate with words and pictures, the gnawing horror that has become the norm for most earthlings. Consequently they will be eaten only during the worst of conditions. I have taken to providing myself with literature from the library, on loan or from the Library Book Sales. I used to be a good customer when I was working, now I am buying one new book a year on average. But I will miss River Reader. The area was lucky to have a book store of this quality so close at hand for a number of years, where the literati always had a place to come in from the cold, sip a cider, share some words and pictures and go home all the happier. We just didn’t buy enough books. I am glad to hear ‘s statements about the Library, being a library employee here in Sonoma County. I hope that the electronic commons being co-created by the Library and our local authors (and in the near future, musicians and artists…) can at least help to provide some continuity of literary community in the sad absence of so many bookstores. I mourn the passing of River Reader, and urge us all to participate the future efforts to build literary community: http://sonomalibrary.org/community. The advent of new technology doesn’t necessarily presage post-apocalyptic futures, i.e., the terminator scenario, but can be the means by which our information quotients are increased and we develop a greater understand of the world and the life that populates it. The county library and its affiliate systems are invaluable resources for self-education, news, entertainments, and general information. They also serve as a transition point for the development of information media for public access. The local author program available through the link David provided illustrates the rich and diverse literary talent living or associated with the North Bay and Coast. Even when all else fails (the day the batteries die) the library will still be information central.